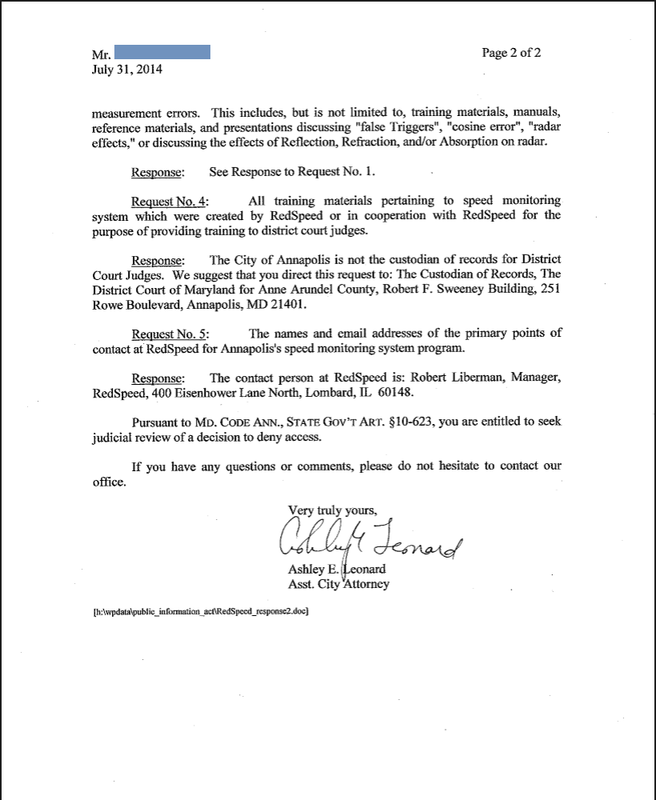 When Annapolis signed their speed camera contract with Redspeed, they included an elaborate secrecy clause specifically blocking the public from obtaining most of the technical details about the cameras, how the program is run, and even documents pertaining to the identification of possible errors from public records requests. The clause uses some of the most restrictive language we have seen in a speed camera contract, and is clearly worded for the specific purpose of thwarting attempts to obtain documentation through the Maryland Public Information Act (the state's equivalent of the FOIA). The contract, which was signed in 2012, is worded to REQUIRE the city to take a public records request to court if necessary, with RedSpeed funding the legal costs of blocking public access. The contract even states that RedSpeed would cover "fines and penalties" imposed on the city if they were punished by the court for failing to comply with the MPIA. That implies that any requester must be willing to pursue a long and expensive court battle to obtain documents even if the basis for the denial would likely be ruled invalid by a court. A supporter of the Maryland Drivers Alliance filed an MPIA request for several categories of items. All training materials and manuals provided by RedSpeed to the City of Annapolis pertaining to the operation of speed monitoring systems. 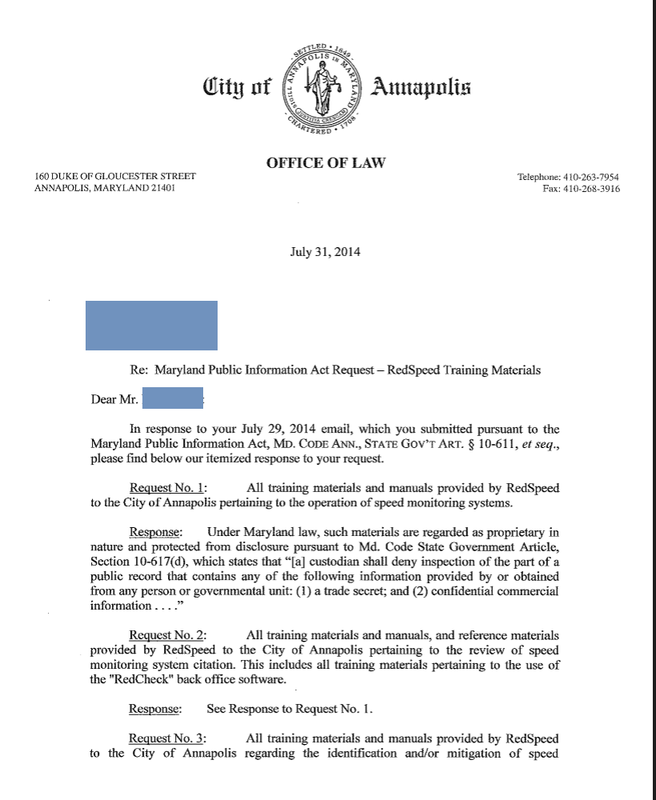 All training materials and manuals, and reference materials provided by RedSpeed to the City of Annapolis pertaining to the review of speed monitoring system citation. All training materials and manuals provided by RedSpeed to the City of Annapolis regarding the identification and/or mitigation of speed measurement errors. This includes, but is not limited to, training materials, manuals, reference materials, and presentations discussing "False Triggers", "cosine error", "radar effects," or discussing the effects of Reflection, Refraction, and/or Absorption on radar. The items in the request were partially prompted by a story reported by the Baltimore Sun, which had stated that three defendants had successfully disputed speed camera citations in district court using time-distance calculations to compute speed. RedSpeed responded to those cases by stating non-specifically that their procedures were "beyond what is mandated by law" and the article stated that "RedSpeed is now offering training on speed camera operations for Anne Arundel judges who preside in traffic court". And the city apparently has followed through on this. The city first responded to the request by stating that the documents were in the custody of Redspeed and that the requester could request them from the contractor. When he actually did so, the Annapolis Police Corporal Amy Miguez initially responded on July 30: "Our program manager at Red Speed, Mario Hernandez, will be sending you the information requested." However the next day the requester received a letter from the Annapolis Office of Law by email which almost completely denied the request. We found it particularly interesting that a contract provision discussing confidential information includes documents about "identification and/or mitigation of speed measurement errors". RedSpeed has encountered speed measurement issues in the past, including an incident in 2012 what RedSpeed attributed to an "electromagnetic anomaly" which caused buses and big panel trucks to be ticketed at incorrect speeds. RedSpeed has now released some of the training materials responsive to this request. We will post details on these documents within a few days.